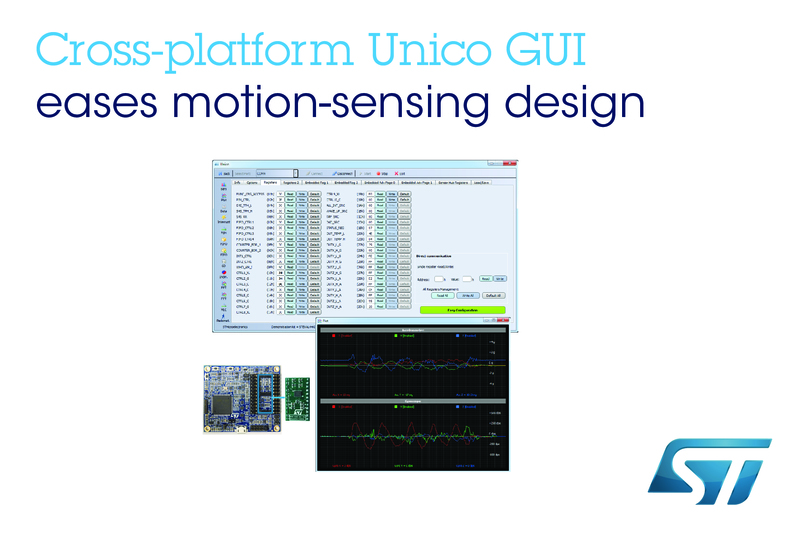 Geneva, April 15, 2019 -- STMicroelectronics’ Unico GUI greatly simplifies configuring the finite state machine and machine learning core (FSM and MLC) logic of its latest Inertial Measurement Units (IMU), including the recently announced LSM6DSO and LSM6DSOX 6-axis modules. The FSM logic lets users run gesture and motion-recognition algorithms directly in the sensor for always-on convenience and low power consumption. The MLC implements machine-learning classifiers for real-time always-on motion and vibration pattern recognition. When used in smartphones, wearables, or industrial devices, the FSM and MLC -- as an embedded, low-power engine for gesture and motion recognition -- allow user-interface functions and context-aware apps to continue running while the main processor sleeps to maximize battery runtime. The LSM6DSO contains logic for up to 16 independent state machines, each generating a hardware interrupt activated by a specific motion pattern, while the LSM6DSOX contains also the logic to implement multiple-stage decision trees for machine-learning classification.